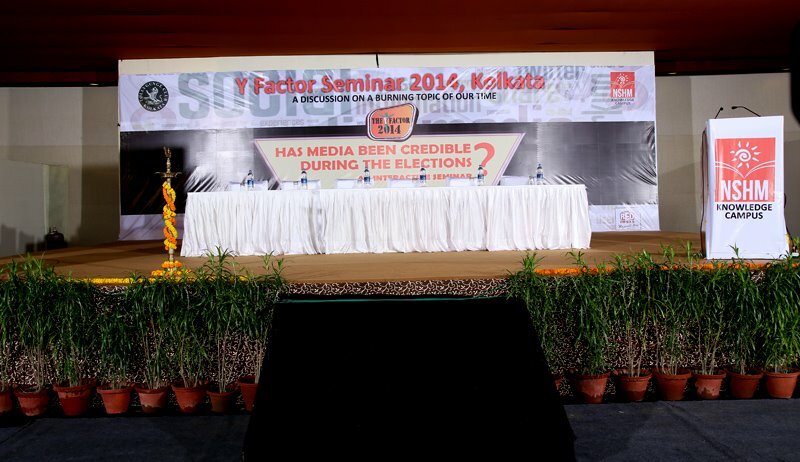 NSHM Institute of Media and Design, the leading media institute in eastern India, in its endeavour to promote the true spirit of media, is back with this year’s edition of the Kolkata chapter of Y- FACTOR. Our esteemed panel members this time are- Mr. MJ Akbar, Mr.
Paranjoy Guha Thakurata, Mr. Somnath Chatterjee and Mr. Jayanta Ghosal. Y-FACTOR is NSHM’s flagship event. It was staged for the first time in 2006. Now into its 8th year, the event has garnered a huge fanfare and is extremely popular among media professionals and students. It’s a matter of great pride for the institution that for each edition of Y-FACTOR, the speakers that it has had on board, have been individuals who have carved a niche for themselves in the media industry. Mr. Sudhir Mishra, Mr. Tarun Tejpal, Mr. M.J. Akbar and many more have graced the event with their presence. They have brought to this seminar, their keen insights and shared with the audience, their invaluable opinions on the topic of discussion.